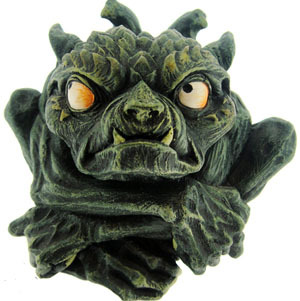 This wonderful gargoyle is made from resin and hand finished in green and black; apart from his eyes of course, that would just be grotesque. He (assuming gender, could be wrong) measures approximately 9.5 cms. Gargoyles from medieval times were thought to scare off evil spirits and, if so this one and the other members of his family would definitely do a good job.